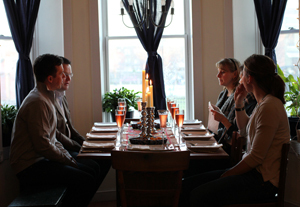 To herald spring, the Three Points cooks gathered in Kate’s D.C. kitchen for our first joint supper club feast. The menu was inspired by Nowruz, the Persian New Year celebration that takes place on the Spring Equinox, March 20 this year. Guests were greeted with a glass of Molly’s home-brewed mead, candles were lit, and we sat down to enjoy a multi-course meal with paired wines: Over dessert, one diner, Chef Alison burst out with, “I love life!” We couldn’t ask for more. Khoresh Fesenjan, slow-cooked chicken stew thickened with walnuts and pomegrante, a centerpiece of festive meals. Herb-Stuffed Fish, whole red snapper made quite the presentation, stuffed with parsley, cilantro, scallions, raisins and pecans (in place of the walnuts called for in the original recipe) and baked in saffron water. Barberries, a difficult-to-find Persian ingredient, were left out here. Click through each item for the recipe. The full photo gallery is here. This feast looks incredible… and it looks like you all had the best time dining like shahs. It is quite a cuisine, isn’t it? FYI the have barberries in WF in Union Square in the odd dried fruit display… in a hanging plastic bag with paper top… they are most like cranberries in that they are sour but very tasty… used in renaissance food in England as well. I can’t wait to try that cherry ice cream!